You have to try this Slow Cooker Breakfast Quinoa. Have you ever had quinoa for breakfast? Quinoa can be very versatile. I have used quinoa in cookies and stir fries in the past, but this was my first try eating quinoa for breakfast. Quinoa is naturally gluten free, so it’s a great alternative to oatmeal. This healthy breakfast quinoa was much better than I ever expected! Slow cooking the quinoa allowed the sugars in the dates and apples to come out. 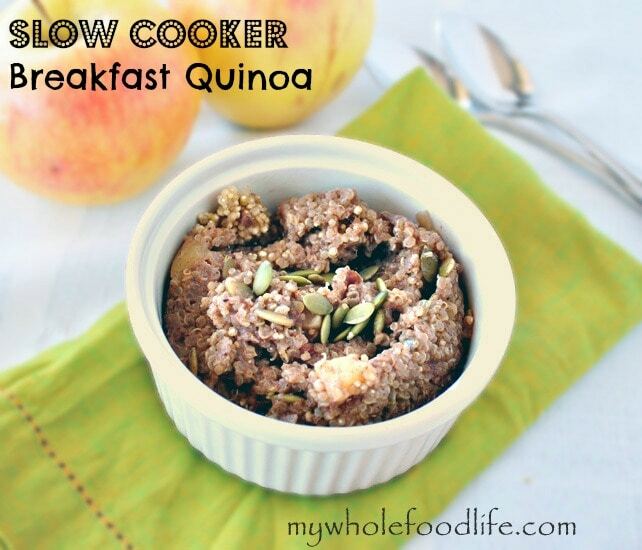 I added no sugar at all to this slow cooker breakfast quinoa. This would be the perfect breakfast to make if you were having company over. It makes a good amount. Like I said before, I thought it was plenty sweet without sugar, but if you like things a bit sweeter, you can always add some maple syrup to it in the morning. Throw all the ingredients in a crock pot . Cook on high for 2 hours or until all the liquid is absorbed. If you want to cook it overnight, turn on the crock pot to low right before you go to bed. It should be ready by morning. You can cook this one low for 8 hours if you want to cook it overnight. It should last a week in the fridge and can probably be frozen as well.